Buzz about “Song of the Sea”, a new hand drawn animated film resonant of the heyday of Disney, may signal a death blow to CGI produced animated movies in the U.S. The film is being heralded as a cinematic masterpiece. The studio is Irish owned and again distinguishes European moviemaking from American cinema. I often draw unflattering criticisms between U.S. based movies and foreign films, mostly because of the U.S. studio tendency to flatten artistic creativity in favor of thee almighty dollar. Recently Michael Douglas decried American actors for a preoccupation with their image rather than their acting. Studios insist that audiences must be repeatedly tested to ensure the highest box office return and that movies must follow formulaic script writing processes to hit the right “notes” with hard to please audiences. “Song of the Sea” seems poised to finally destroy these entrenched myths and hopefully herald some copycat hand-drawn stories of our own. For about 20 years American animation has been defined by increasingly slick pixelated movies, beginning with Toy Story (which later became a franchise), Monsters, Inc., Jimmy Neutron, Cars, Ice Age and numerous other feature and straight-to-dvd CGI movies. Some of these films lacked strong stories or interesting characters- they simply relied on the technology to grab kids’ attention at the expense of their parents’ money and interest. Since what one American studio does is instantly copied by every other one, moviegoers were left flat and disappointed by visually sophisticated kids’ movies that relied on virtually plagiarized plots and catchy music that could be used later to sell toys based on the films. Like all American cinematic innovations, the CGI technique was overused and eventually abused – applied to the most mundane of animated movies. I won’t name any here but just check Imdb.com. Even worse, detailed hand-drawn films were relegated to a dusty old bin called “the past”. One of the last Disney films to use hand-drawn animation was “The Princess and The Frog” way back in 2009. Artistic renderings were expected to be produced by computers rather than talented humans. Though this trend is continuing with sequels to “Frozen” (2015), “Ice Age Part 5” (2016), “The Incredibles Part 2” (2016), and “Toy Story Part 4 (2017)”, I now have hope that parents will challenge this computer generated madness with more confidence and support movies like “Song of the Sea” with their movie dollars. The trailer for “Song of the Sea” is intriguing with lovely, restful colors and lyrical Irish music murmuring in the background. The main character, a little boy, is not trying to save the world in a supercool 3-D spaceship or by designing a new kind of plasma gun. He is just trying to help his little sister – awwww (cue sad music). 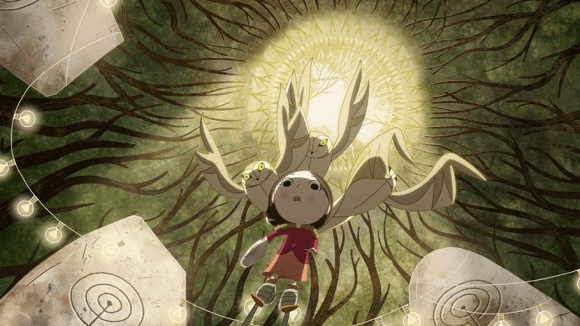 The Irish studio behind “Song of the Sea” is the same one who produced “The Secret of Kells”, another successful hand drawn feature film based on Irish legends. With an onslaught of U.S. CGI kids’ movies to contend with, I think “Song of the Sea” will drown out the competition not with loud, flashy graphics, but a simple, beautiful song.